Not so long ago, I was wandering the glorious halls of the Capodimonte museum in Naples, delirious like a child over having the museum practically all to myself (such is the case with the museums in Naples), when I was stopped by two very beautifully crafted paintings appearing in the left corner of my eye, “The Misanthrope” and the “Blind Leading the Blind” by Bruegel. 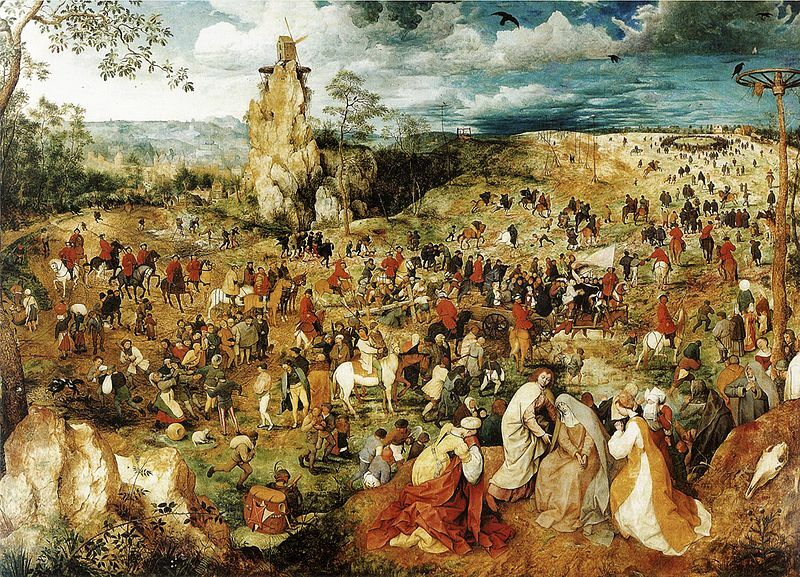 I am not sure if there is anything quite like coming across a Bruegel painting when visiting a museum, being both very poignant and invigorating for the eye and mind at the same time. There are times when I am just exhausted from seeing so many famous paintings and crumbling fragments and “formal concerns.” Coming across a panel of such perfectly sustained, fragrant colors that are hundreds of years old, with so many details to linger over and a continually relevant life theme to ponder, is perhaps art absorption at its dearest and finest. All sounds around me went faint as I heard my blood pulsing and my heart aching; the goosebumps finally overwhelmed me, turning me into one big slushy mess of an artist-tourist who would have to try to put her life back together. Update: since posting, I was sent this video interpretation of Bruegel’s painting created by Nir Nadler and Chaja Hertog, a triptych compilation of figures set in the misty, haunting landscape of Holland in a focus which ranges from sharp to foggy. A beautiful adaptation. 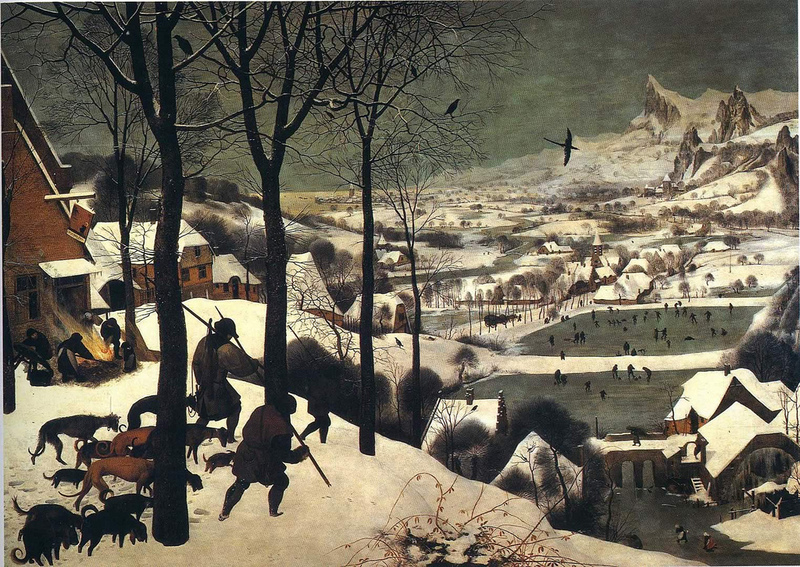 When I was a child, I used to love looking at Bruegel’s painting of the Hunters in the Snow. That snow looked just as real and cold as snow, and I longed to get out there with the other skaters in what seemed a perfect winter wonderland of paint. The hunters, however, gave me a shudder of something with a different, inexplicable quality of cold. Still today, I feel the same in looking at this painting, preferring the skaters over the hunters, having learned a bit more about that second kind of chill. 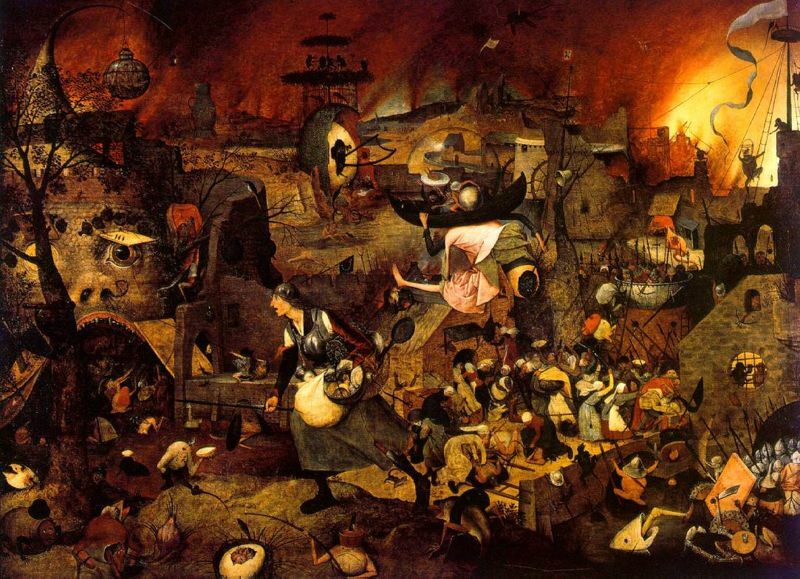 As for the painting Dulle Griet, also known as Mad Meg, I am relieved I learned about it as an adult, for the nightmare probability is quite high from viewing such a magnificent painting like this. 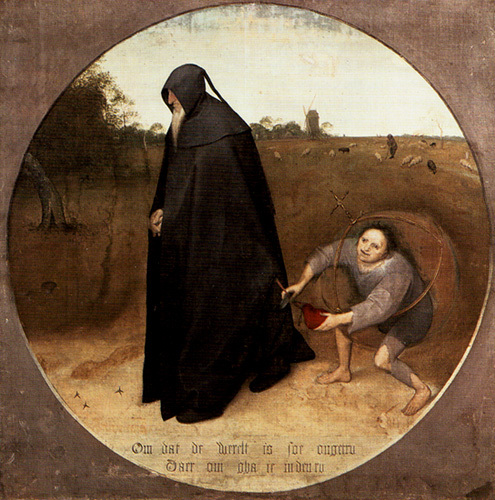 Mad Meg is the Anglicized version of Dulle Griet, a peasant woman figure of Flemish folklore who leads an army of women to pillage Hell, wearing an apron and armed with rough language and tools of male aggression. She is also the subject of a 1640s painting by Flemish painter David Teniers the Younger, and she appears as a character in Caryl Churchill’s Play “Top Girls” (1982), where she recounts her invasion of Hell: “I’d had enough, I was mad, I hate the bastards. I come out my front door that morning and shout till my neighbors come out and I said, “Come on, we’re going where the evil come from and pay the bastards out. '” (Churchill, 28). 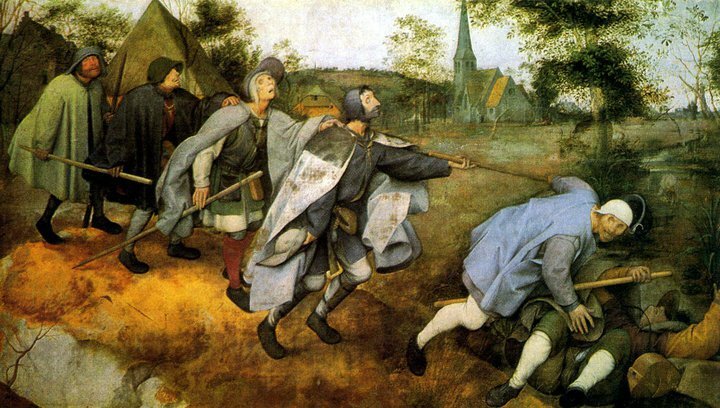 But mostly, Bruegel created paintings that richly suggest that we stop to reflect, no matter if we are contemplating ice skaters, hunters, crucifixions, demonic peasant women or Icarus falling from the sky. As W.H. 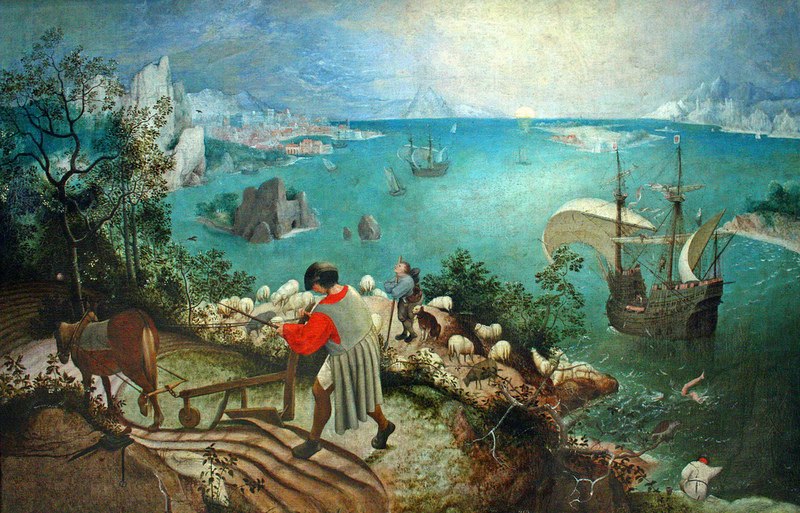 Auden explains in his poem, great masters such as Bruegel show how most people are too oblivious to care. One feeling is excited by another. Our faculties work best in a congenial emotional atmosphere. The contemporary fashion is to admire beyond all others the painter who can concentrate on the formal side of his art and produce pictures which are entirely devoid of literature. Old Renoir’s apophthegm, “Un peintre, voyez-vous, qui a le sentiment du téton et des fesses, est un homme sauvé,” is considered by the purists suspiciously latitudinarian. A painter who has the sentiment of the pap and the buttocks is a painter who portrays real models with gusto. Your pure aesthete should only have a feeling for hemispheres, curved lines and surfaces. But this “sentiment of the buttocks” is common to all good painters. It is the lowest common measure of the whole profession. It is possible, like Mantegna, to have a passionate feeling for all that is solid, and at the same time to be a stoic philosopher and a hero-worshiper; possible, with Michelangelo, to have a complete realization of breasts and also an interest in the soul or, like Rubens, to have a sentiment for human greatness as well as for human rumps. The greater includes the less; great dramatic or reflective painters know everything that the aestheticians who paint geometrical pictures, apples or buttocks know, and a great deal more besides. What they have to say about formal relations, though important, is only a part of what they have to express. The contemporary insistence on form to the exclusion of everything else is an absurdity. So was the older insistence on exact imitation and sentiment to the exclusion of form. There need be no exclusions. In spite of the single name, there are many different kinds of painters and all of them, with the exception of those who cannot paint, and those whose minds are trivial, vulgar and tedious, have a right to exist. Every good painter invents a new way of painting. Is this man a competent painter? Has he something to say, is he genuine? These are the questions a critic must ask himself. Not, Does he conform with my theory of imitation, or distortion, or moral purity, or significant form? You can read the rest of Huxley’s essay here. No need to rush off, though, as each image below is an “island of consciousness” well worth visiting.